Delta’s first Airbus A350, Ship 3501, left Airbus’ paint shop in Toulouse, France, on Tuesday coated in Delta’s signature livery as the aircraft prepares to be delivered in July. The state-of-the-art widebody jet had its first test flight two weeks ago and will undergo additional flight testing in France before being handed over to Delta, Ship 3501 is expected to enter service this fall on trans-Pacific routes. 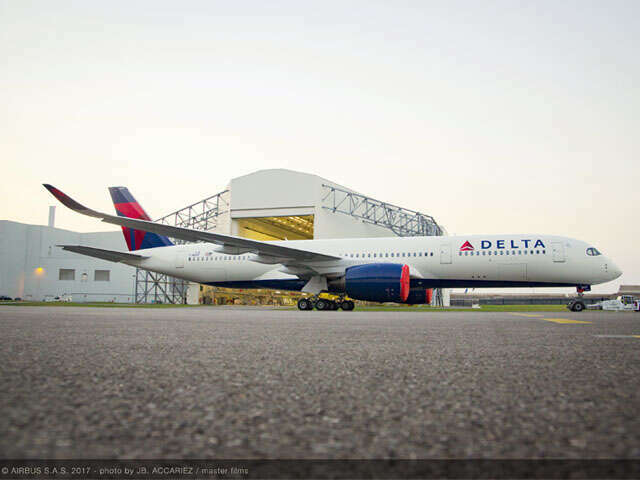 Delta will be the first U.S. carrier to take delivery of the A350. As Delta’s flagship international aircraft, the A350 will be debut the airline’s Delta One suites in the business class cabin as well as Delta Premium Select. The aircraft will feature 32 Delta One suites, 48 Delta Premium Select seats and 226 seats in the Main Cabin.